The applications from the talented and energetic candidates are invited for Fully Funded Summer Internship in Singapore 2018. 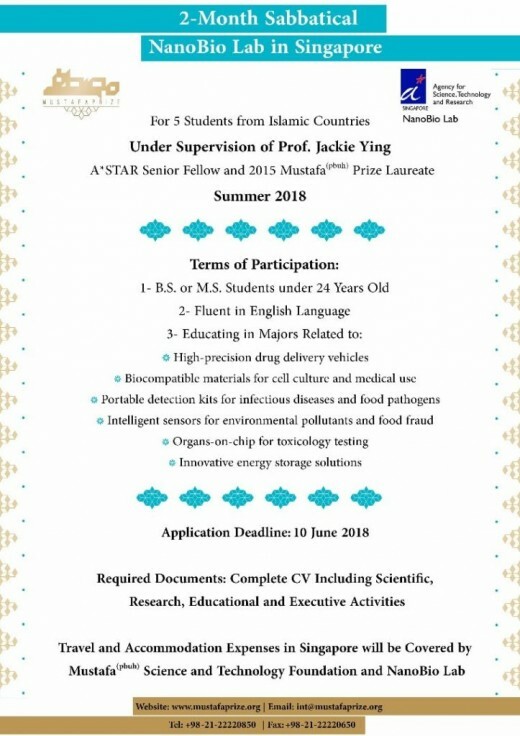 Mustafa (PBUH) Foundation (MSTF) and NanoBio Lab is offering new batch of Summer Interns to do Internship in Singapore for international students at Mustafa (PBUH) Science and Technology Foundation and NanoBio Lab to enhance scientific level of university students in Islamic countries and to create opportunities to gain new experiences in international scale with the use of capacities of Islamic world. In this fully funded Summer Internship Program 2018 the students will get valuable career building skills and it will provide the opportunity to become skilled professional in your chosen field of interest. Mustafa (PBUH) Science and Technology Foundation (MSTF) and NanoBio Lab. Travel and Accommodation in Singapore will be provided by Mustafa (PBUH) Science and Technology Foundation (MSTF) and NanoBio Lab. Complete CV with scientific research, educational an elective activities.